Unfortunately it’s getting to be that time where we need to figure out what to make our kids for lunch. The school my kids go to had a microwave for the kids to heat their lunches, but because the school keeps getting bigger the lunch room is no longer available, the kids eat their lunch in their classrooms. Sadly no more heat up lunches allowed. My kids get sick of sandwiches every day, and I loose my creativity sometimes. Thinking outside of the box is important when crafting a lunch that your kids will eat and won’t trade, or throw in the garbage. Baked Tofu. This would hold up well in their lunch kits. I could see this over rice, as pictured, or in a wrap, over some noodles. 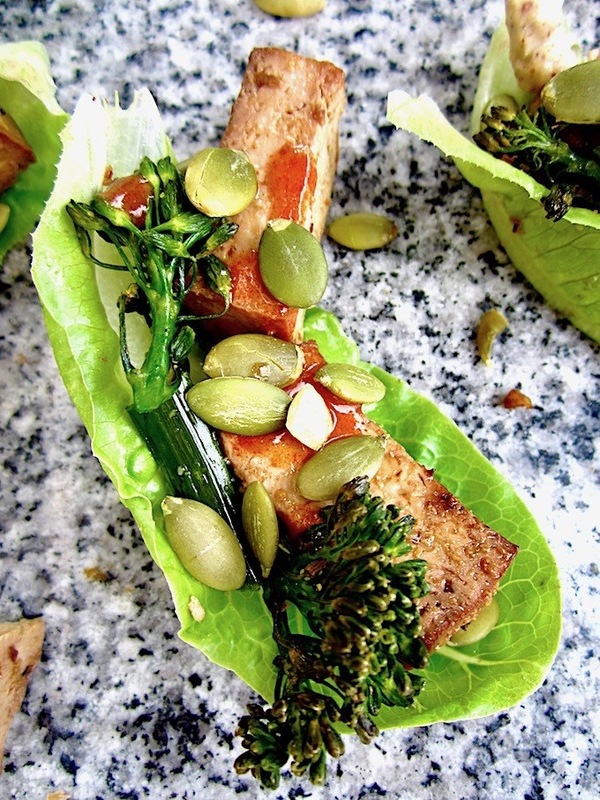 Book mark this one for your go to baked tofu. Photo credit goes to Sarah from Fried Dandelions. 2. White bean and artichoke sandwich filling. To switch things up a bit, I’d be tempted to make her burger recipe (that inspired this recipe) and see if it would hold up- read- keep warm. Photo credit goes to Mel from A Virtual Vegan. 3. Chickpea and vegetable picnic hand pies. These would be fun to eat. I think there’ll be lots of hand pies in our future, both savoury and sweet! Photo credit goes to Jacqueline from Tinned Tomatoes. 4. Easy quinoa and cheese patties. These look really good, don’t you think? Photo credit goes to Nico from Yumsome. 5. Vegan Chickpea Mayonnaise Salad Sandwich. Who doesn’t love chickpeas? Photo credit goes to Rhian’s Recipes. 6. 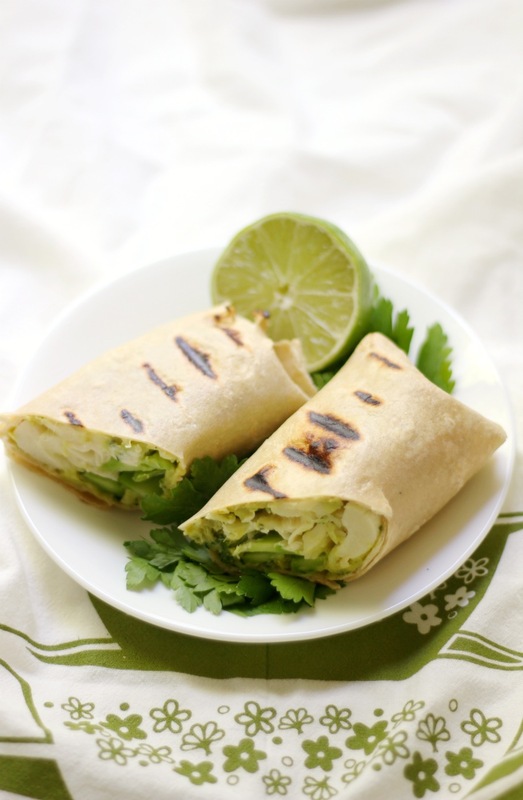 Grilled green Goddess Wraps. Looks so fresh! Photo credit goes to Rebecca from Strength and Sunshine. 7. 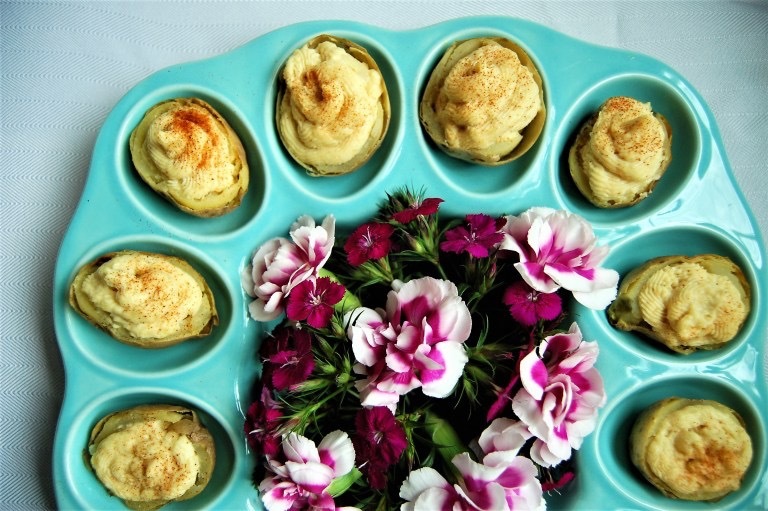 Egg free deviled potatoes. This is a nice treat. Photo credit goes to Monica from The Hidden Veggies. 8. Easy vegan tofu lettuce wraps. The kids can easily assemble this at lunch time. Photo credit goes to Vegan Chickpea. 9. 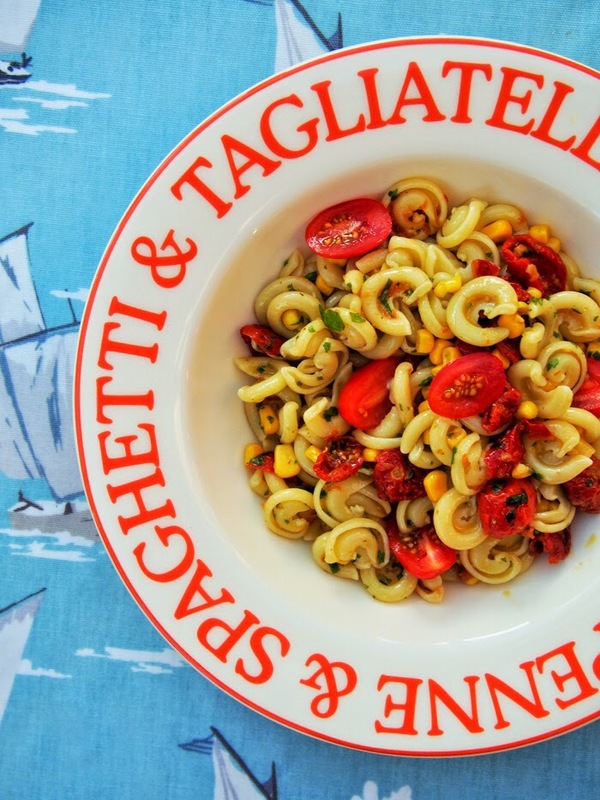 Weeknight pasta in a flash. Leftovers are perfect for lunches, double the batch :). Photo credit goes to Jacquline from Tinned Tomatoes. 10. 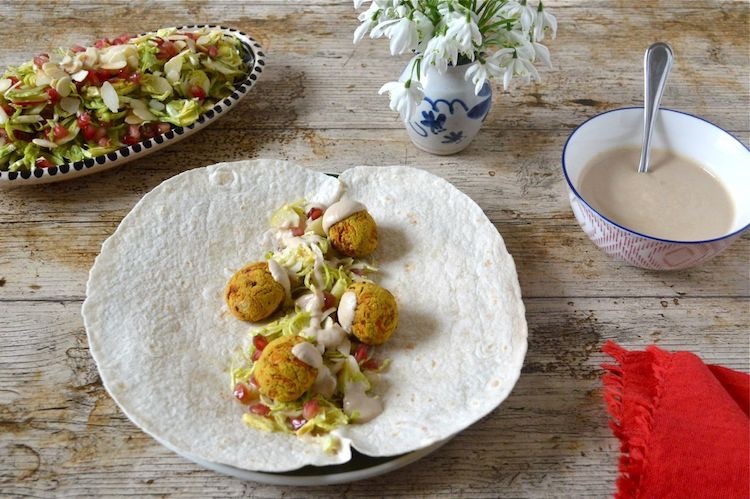 Air Fryer Carrot Falafel with Tahini Sauce. I love air fryer recipes don’t you? Photo credit goes to Choclette from Tin and Thyme. 11. 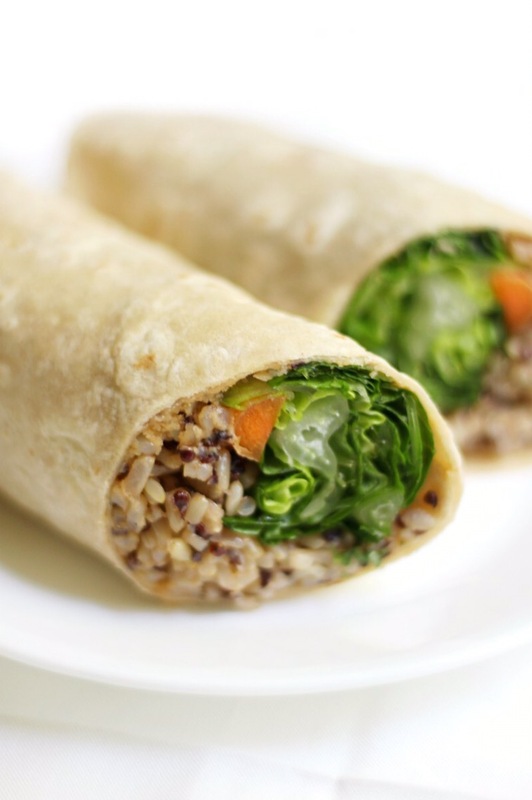 Buffalo tahini quinoa and rice wraps. I could eat this every day! Photo credit goes to Rebecca from Strength and Sunshine. 12. 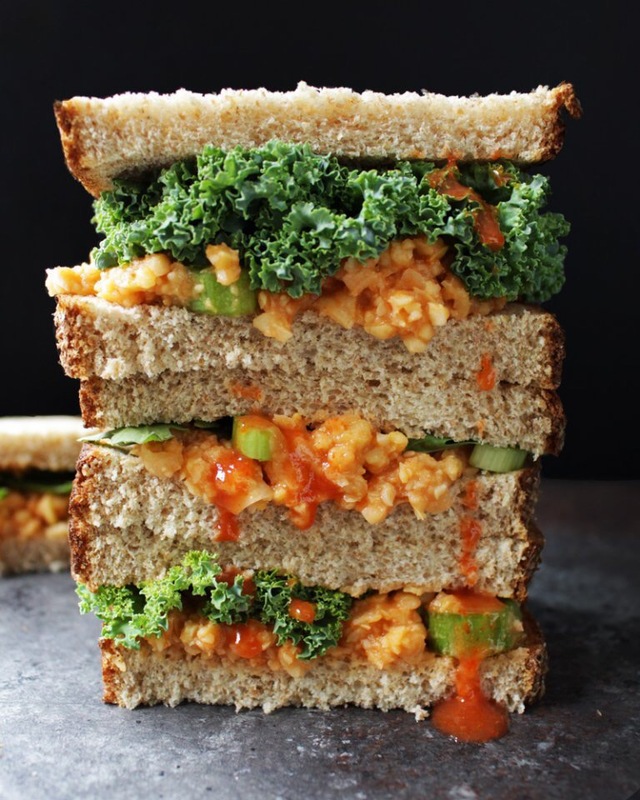 Buffalo chickpea salad sandwich. This would be great on freshly made bread. Photo credit goes to Karissa. 13. 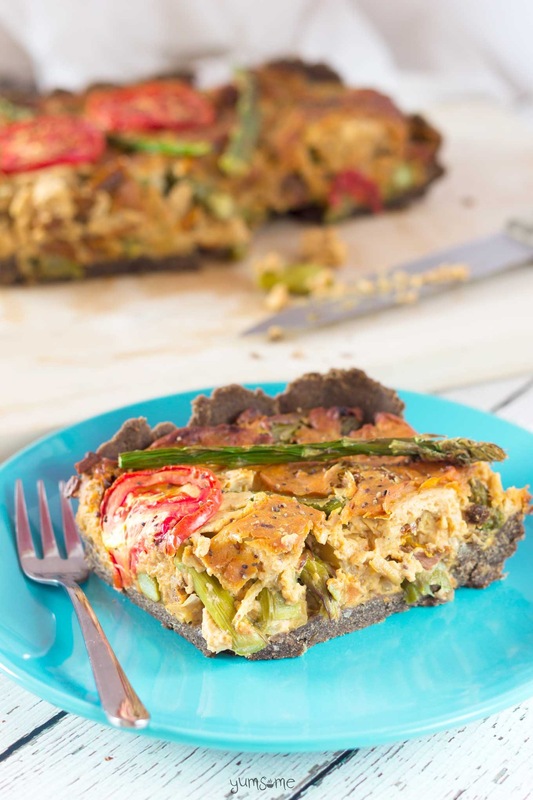 Vegan asparagus and sun-dried tomato quiche. I’m not a fan of crust in any quiche dish, I would enjoy this without it. Photo credit goes to Nico from Yumsome. 14. 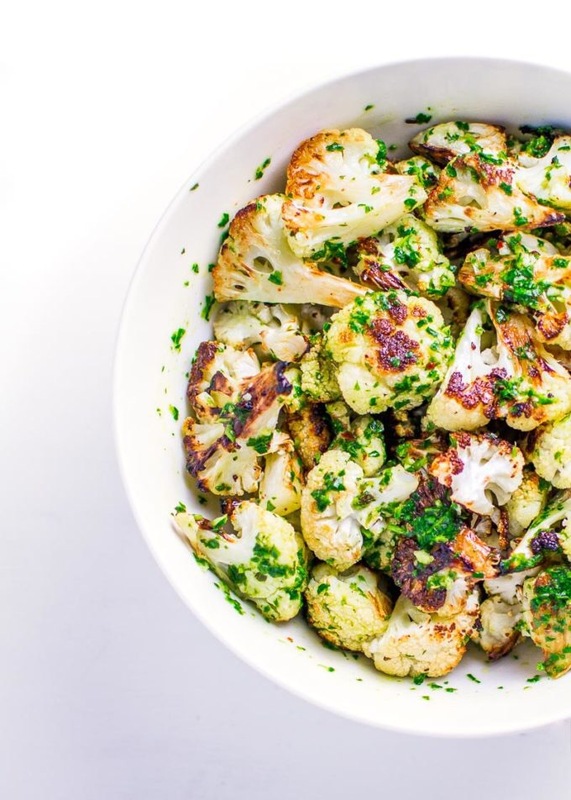 Roasted Cauliflower Chimichurri. Another great way to use cauliflower!! Photo credit goes to Kate from Root + Revel. That gives you more than 2 weeks worth of main meals for school lunches. Now for the treats! I wish you could see the look of surprise on your childs face(s) when he/she opens up their lunch kits. Although you don’t need to wait to make these delicious treats! 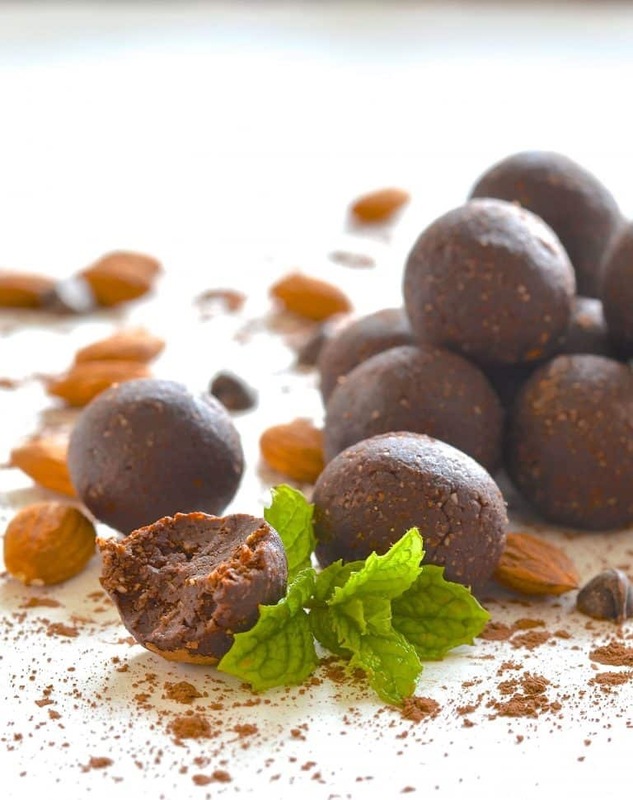 Mint Chocolate Truffle Larabar Bites. She had me at mint chocolate. *drooling*. Photo credit goes to Melanie from A Virtual Vegan. 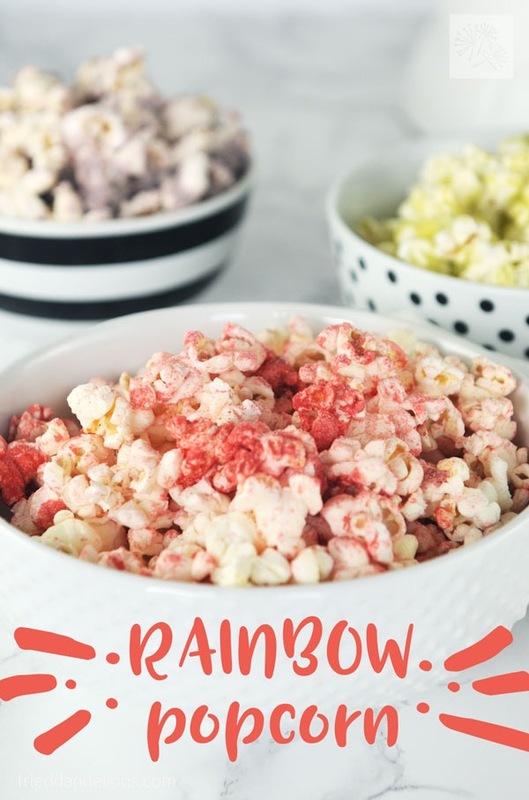 Rainbow popcorn. Seriously, how fun is this? Photo credit goes to Sarah from Fried Dandelions. 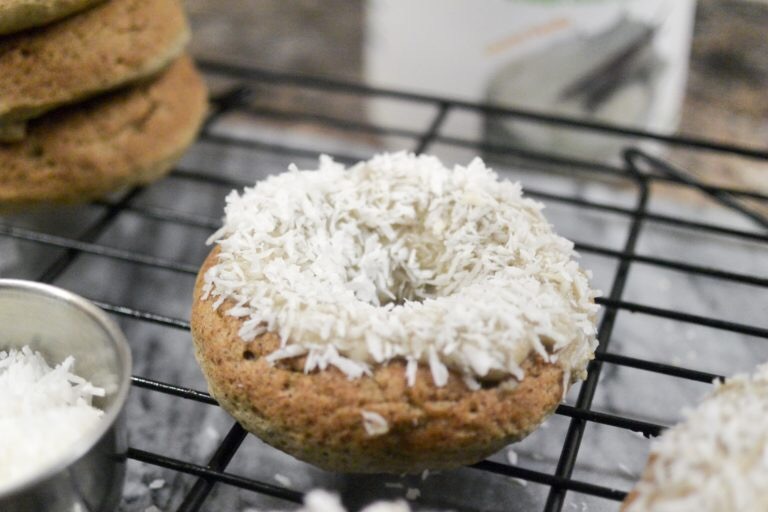 Protein Donuts. I don’t know about your kids, but mine love it when I surprise them with donuts. Photo credit goes to Olivia from Lettuce Liv. 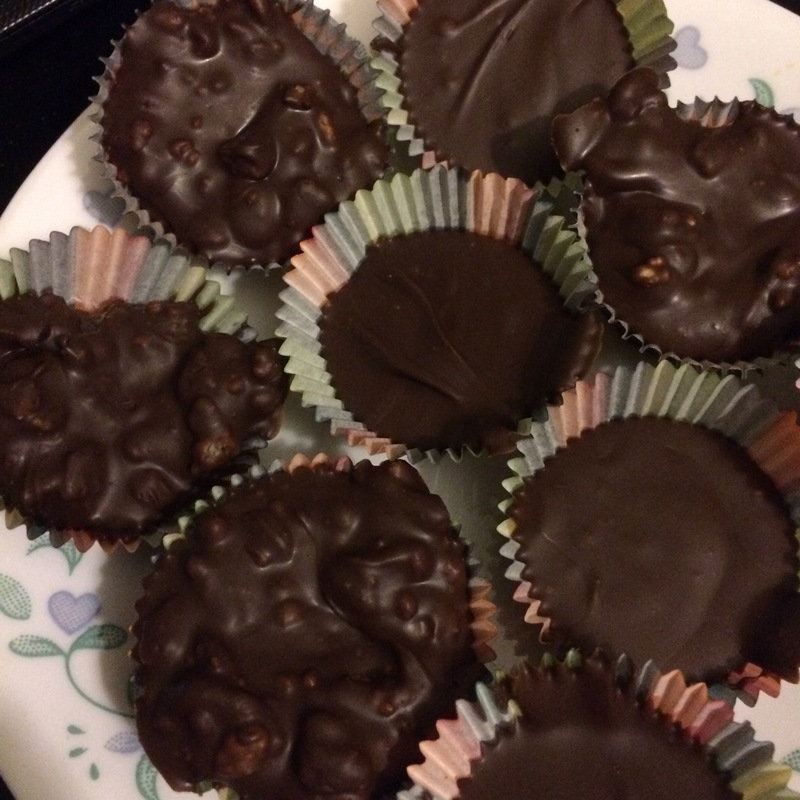 Peanut Butter cups. I’ve made this a few different ways. Huge hit with the kids. Tess Challis wrote A Dozen Healthy (and Easy) Snacks Your Kids Won’t Hate. for Vegan Pregnancy and Parenting. After your finished reading the article, browse the website. It has everything you wanted or needed to know about raising vegan kids. I hope you found this round up useful. What are your go to school lunches?